As teachers’ strikes have taken off all over the country, it would be a shame to imagine that a national nonprofit set squarely in the midst of the education scene was encouraging its corps members to cross the picket lines. 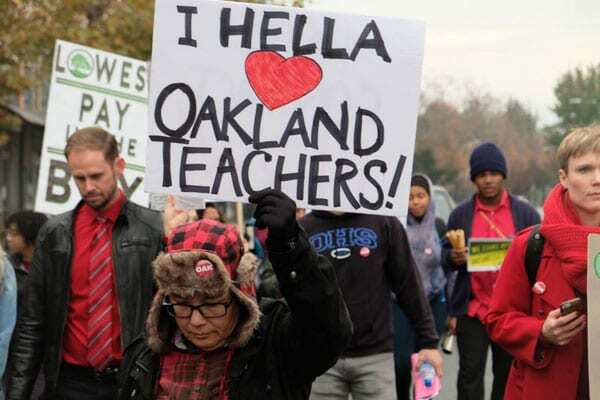 But more than 300 former Teach for America (TFA) educators have sent a letter to the program expressing outrage about the way that TFA has been pressuring current recruits to cross the picket line in Oakland, California, should a teachers’ strike be called in that city. TFA members have been found by the NLRB to be eligible for union membership. Payton Carter, one of those alumni, and now an Oakland teacher, said the organization has threatened that those who observe the strike may lose a $2,000 to $10,000 bonus used as a recruitment tool—a bonus that is paid out at the end of their two-year term of service. Speaking for TFA, Jack Hardy says the whole thing is a misunderstanding. “We don’t have a position on the strike or organizing,” he says. “Our corps members, we stand behind them, we stand beside them. Our goal is to help them be successful.” Hardy says the organization was just sharing rules from AmeriCorps with its recruits. If it is a misunderstanding, it is widely shared. Ismael Armendariz, first vice president of the Oakland Education Association and a TFA alumnus, says the message from TFA was clearly targeted to persuade TFA corps members to cross the picket line. Will Corvin, who is a TFA corps member at Oakland High School, says all TFA teachers at that school have chosen to be union members and that he owes his support in appreciation for all the help and mentoring other older teachers have given him.